This weekend is the best time to see Jupiter of all 2017, because the planet is at opposition, meaning it is exactly opposite to the Sun and the Earth-Jupiter separation is also at its closest. The photo below was taken during the September 2010 event and I happened to fall upon a fantastic low turbulence window in the atmosphere. 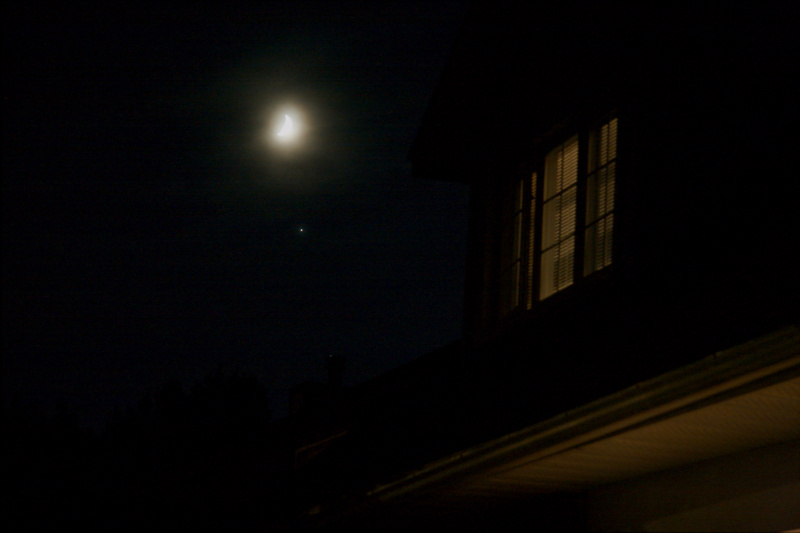 Look closely and you’ll see the shadow of one of those moons on the Jupiter’s surface. 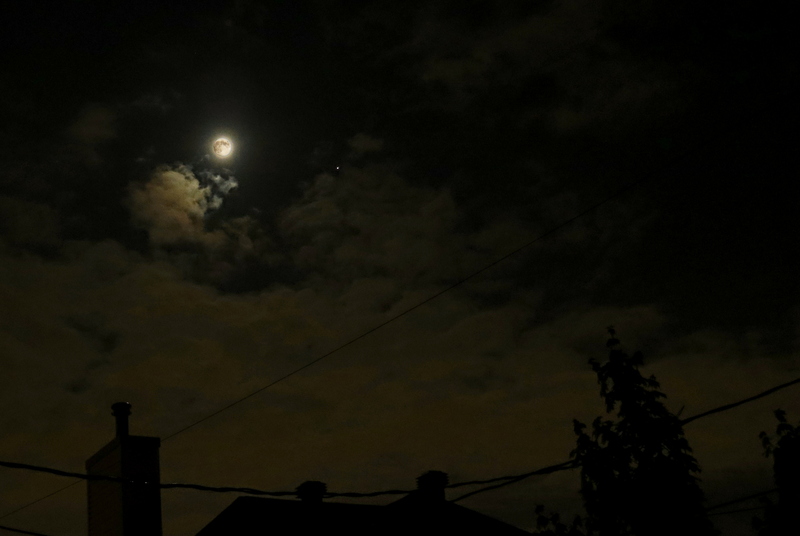 Photos of Jupiter with the moons are a little tricky. 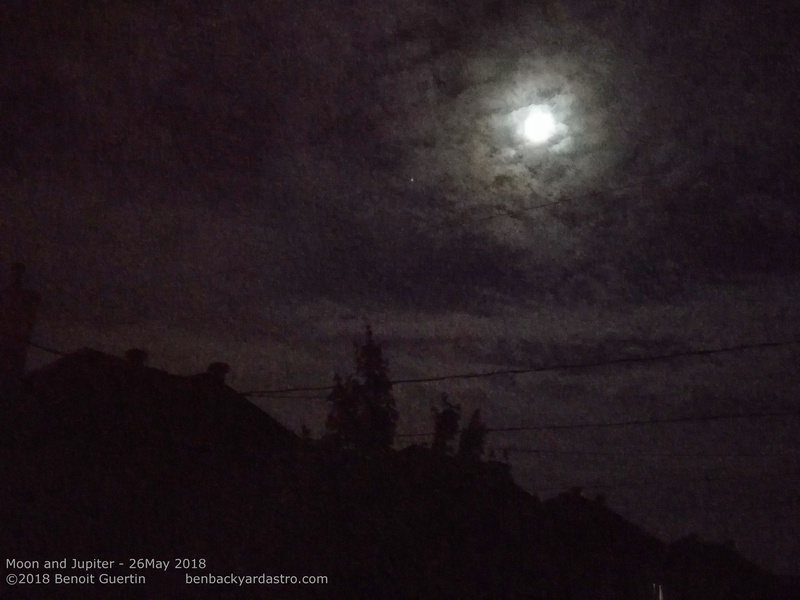 Capturing the smaller moons require more exposure or gain, but at the risk of over-exposing the planet and turning Jupiter with those wonderful cloud bands into nothing more than a white sphere. It is always better to take a series of images or videos with different settings and review them at a later time on the computer. Some information on planetary imaging and processing is provided in my blog on imaging with a webcam. Allow your equipment to cool down a few minutes such that the equipment temperature can stabilize and match the outdoors. Past midnight is better as this allows time for the ground to cool especially after a sunny afternoon, reducing convective currents. Wait until Jupiter is high in the sky, that way there is less atmosphere between you and Jupiter. By looking straight up, you will be looking through a smaller “air column”. A good time will be on April 10th when the Moon will next to Jupiter. 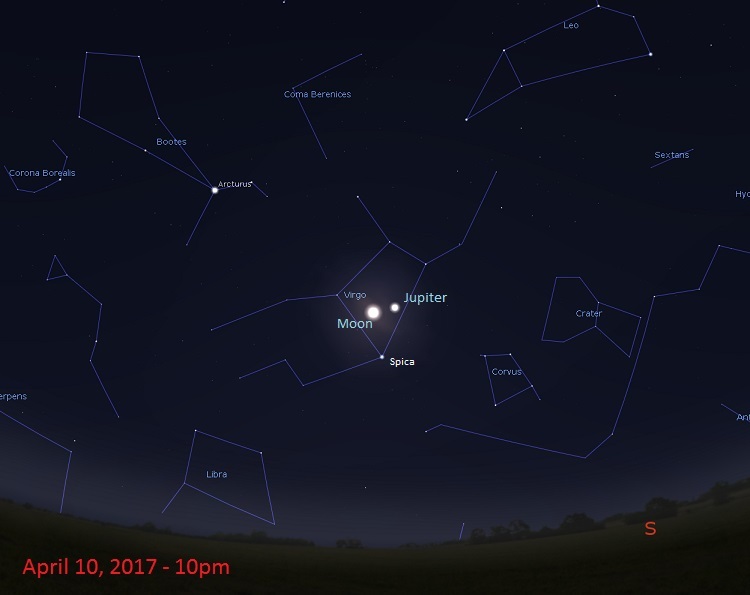 See the sky chart below showing the southern part of the sky at 10pm EDT. The planet will track west as the night advances. JunoCam onboard the Juno spacecraft is providing us with some great pictures of the Jupiter cloud top, but from the rarely seen polar angle. Pretty much all spacecrafts that have visited Jupiter did so with a fly by along the equatorial plane, which is also the same plane we observe Jupiter here on Earth. However with the Juno spacecraft, we now have a chance to enter into a polar orbit and take pictures of the polar regions. Part of the reason behind JunoCam is to get the amateur astronomer community participating in selecting what parts of Jupiter the camera should be snapping pictures, and of processing the raw images. The image below was captured by JunoCam during Juno’s 3rd swing around Jupiter at a distance of about 37,000km. The south polar region is on the left. The above was the PeriJove3 encounter (3rd pass), and voting on the next PeriJove4 will take place between January 19th and 23rd 2017. This is where the community can propose and vote for Points of Interest to photograph with JunoCam during the rather quick (2 hours) close pass with Juno. You can even submit images of Jupiter taken with your equipment to help plan the Points of Interest.